Career Tracks is a job classification system for staff not represented by a union. Career Tracks enables UC to define job titles consistently within each location and across the university. 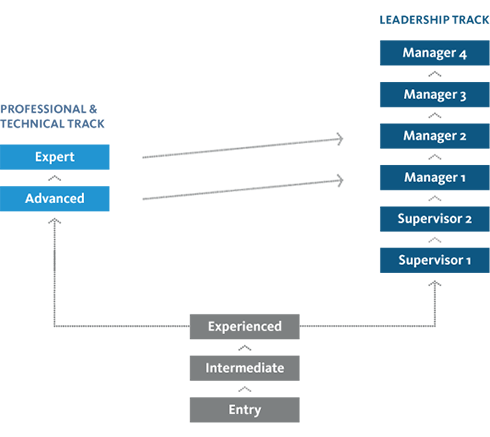 Levels for individual contributor, supervisory and management roles within each distinct functional area are defined consistently across occupations and with the labor market for comparable jobs. It gives employees better-defined career paths within their job functions. Since it’s systemwide, employees can see how to advance their career at any UC location. Job titles reflect primary job responsibilities, supporting efforts to recruit and retain qualified employees, and are aligned with pay practices in the local labor market. With salary ranges reflecting the local market, managers can make better pay decisions. Four UC locations have already implemented Career Tracks, and all UC locations will implement the system over the next few years. Career Tracks is being rolled out at different times at different locations. The locations below have published websites with additional information regarding their project.